Comedian Rick Gutierrez has been cracking up audiences across the country with his throwback takes on traditional family values and outlooks on marriage for years, but it's about time some higher ups in Hollywood finally got wind of his comedic talents. Rick can currently be seen in FUSEtv’s "Fluffy's Food Adventures". The show premiered in 2015 and was the most watched program on the network. 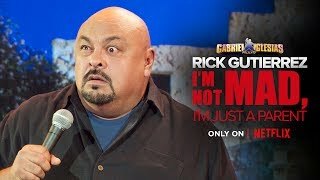 Rick’s one hour special, "I’m Not Mad, I’m Just A Parent" produced by Gabriel Iglesias and LEG aired on NUVOtv and can be seen on Netflix. Rick's other television credits include NBC's "Friday Night Videos", BET's "Comic View” and Showtime's "Latino Laugh Festival". He has appeared in 2 seasons of the Comedy Central series “Gabriel Iglesias Presents Stand-Up Revolution”. He has toured with Gabriel on his Unity Through Laughter and Fluffy Breaks Even tours and he is currently headlining clubs all around the country.